← Plan B for Saturday’s Mobile Food Truck will keep everyone DRY! Rainy day food distribution yields many Blessings! Junior Service League of Huntsville had a great time on Saturday serving those in need by distributing food from the Houston Food Bank’s mobile food truck! Despite the rainy day, many lives were blessed! 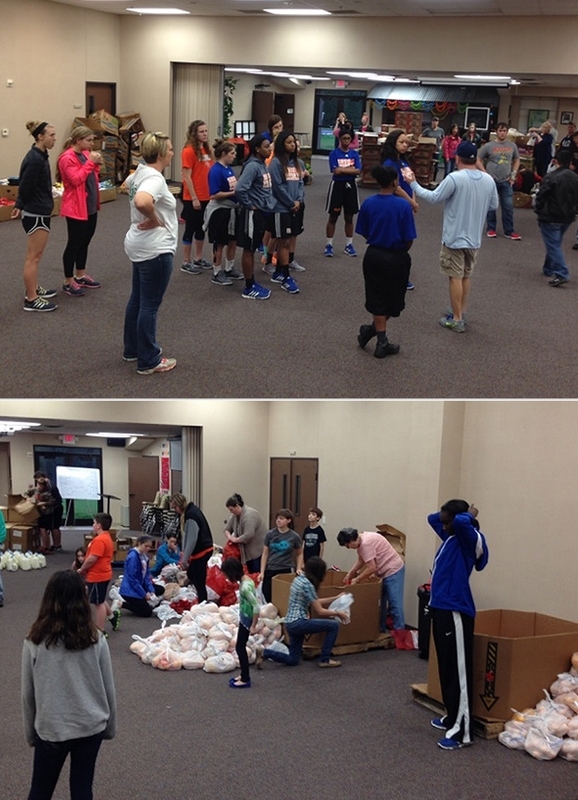 We were honored to work alongside wonderful partners such as the Huntsville Church of Christ, SHSU Women’s Basketball team, SHSU Dietetics, Walker County Healthy Initiatives, students from SHSU and Alpha Omega Academy, and many other citizens from the community. In addition to receiving fresh produce, the students from SHSU Dietetics offered free nutritional advice and information. Attendees who battle chronic diseases were able to take home free blood pressure cuffs and blood glucose monitors and strips from Walker County Healthy Initiatives. All in all, it was a fantastic turn out and the rain didn’t dampen the spirit of giving!! Great job, Huntsville! You helped feed over 350 people on a dreary, rainy day. Lives were blessed!